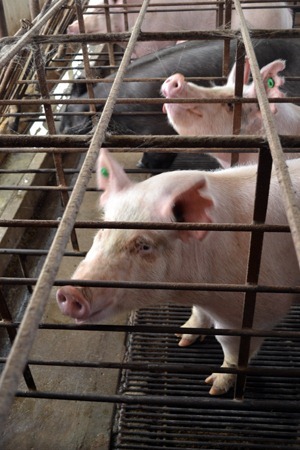 Recently, raising pigs in gestation stalls has been getting a lot of attention in the media. Almost all pigs in the United States are raised indoors. 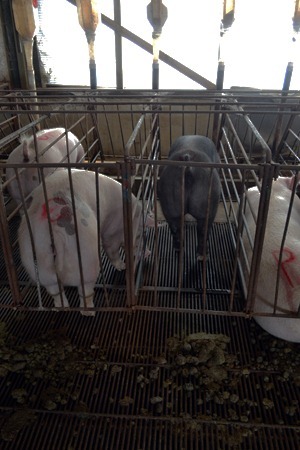 And most sows (adult female pigs) are kept in gestation stalls. Yes, there are both pros and cons to this type of housing. Let’s talk about that. When Heather and I walked into the gestation barn, the sows were laying down, resting quietly. When they heard the door open and saw us come in, they perked right up, started snorting and making pig noises, and wanted to see what we were up to. Why are the pigs inside all the time? We already talked about being able to control the pigs’ environment as one of the benefits of moving pigs indoors. 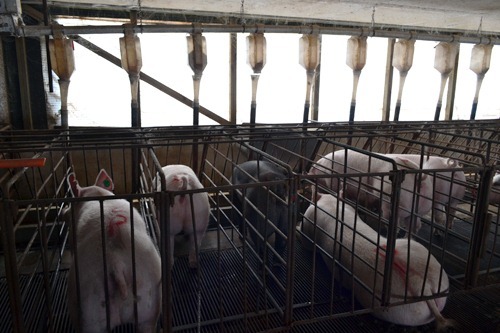 Keeping pigs inside lets us control the temperature of their environment. In the summer, Heather puts up a “cool cell” along one wall of the gestation barn. The cool cell acts as a giant air conditioner. In combination with curtains and ventilation fans, the cool cell keeps the gestation barn at a comfortable 70 degrees all year round. Did you know that pigs can get sunburn? Most pigs have pale skin, and they are very susceptible to sunburn if they are outside without enough shade. Pigs are a natural prey species, and keeping them indoors protects them (the adults and the babies) from predators. Pigs are also susceptible to a parasite that lives in the soil, called Trichinella. This parasite can infect people if they eat infected pork that has not been completely cooked. By keeping pigs inside, they are never exposed to this parasite, so it protects them and people from getting Trichinosis. Why use stalls instead of group pens? The biggest benefit of keeping sows in stalls is that the farmer can control how much food each sow gets to eat. Just like other animals, if they are not separated during meal times, one “boss sow” can guard the food and not let the other animals eat. Each private gestation stall has its own automatic feeder. The white bottles at the top of this picture are the feeders for each stall. Twice a day, each sow is fed exactly the amount of feed she needs. Bigger sows get fed more, and smaller sows get fed less. Young gilts (female pigs who have not had piglets yet) who are still growing get fed even more. They also have access to plenty of water in a trough that runs the length of the row of pens. This trough is refilled twice a day so there is always fresh water available. There is plenty of room for the pigs to get up, lay down, and move back and forth in their own stalls. 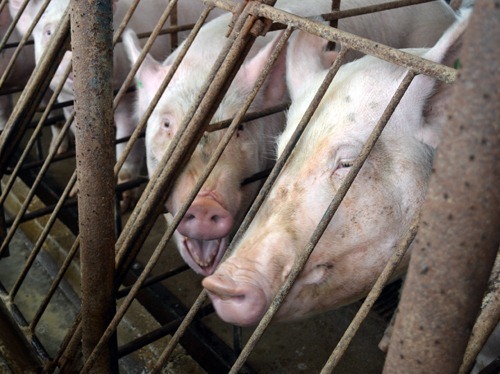 Pigs tend to urinate and defecate towards the back of the stalls. This keeps the urine and manure outside of their stall so they don’t lay in it. If they could turn around in these stalls, they would urinate and defecate at the other end of the stall, which is where their feed and water is. Unfortunately, pigs are not very discriminating. They would continue to eat and drink, even if their food and water was contaminated with urine and manure. This can make pigs (or any animal!) very sick. Sows are naturally aggressive towards each other. In a group, they want to know who is in charge. And they’re not afraid to fight to figure that out. 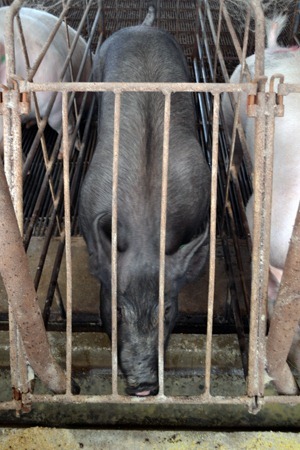 In the photo below, this sow is chewing on the bars of her stall. Imagine her chewing on the sow next to her, instead of the stall! While aggression is a “normal” behavior for pigs, it can be a very harmful behavior. Keeping sows in private, separate stalls gives them access to plenty of food and water (without having to compete with any other pigs for their food), gives them protection from any sow that might be a bully, and gives them a “safe” space where they can lay down and relax, without having to worry about who might be coming up behind them. Great blog Marybeth! Very informative and explains a lot of questions people have. Thanks, Chelsea. I’m glad you enjoyed it. Let me know if you have any questions that I haven’t answered as we go through National Pork Month! I’m so happy that you are writing this blog, it really helps answer my questions about these kinds of topics and makes me feel better about my decision to not be a vegetarian. If I was a farmer and I only had one pig, then I think that I could maybe let her roam free. But in a situation like this, yes, this does seem the best way to keep all the pigs happy and healthy. Dani – Thanks for your comment. I’m glad this blog is helping you understand how animals are raised, and why farmers use the practices they do. Let me know if you have any specific questions! I have seen some studies where the sows could electively go into the stalls or out of them. The vast majority of the sows spent their time in the stalls where they could rest and not be bothered by the “boss sow”. Sows can be really mean! And don’t forget another parasite, roundworms, whose eggs can survive over 30 years in the soil. Those affect people as well! Thanks for the always informative and great blog! You’re right, Diane, in free stall barns where pigs have the option to hang out with everyone or go into their own stall (like the dairy barn we looked at in June), the pigs do spend most of the time in their own space. I think sows are a lot like high school girls – they form their own cliques and don’t like anybody else! So they do have freestall pig barns? Awesome. I had wondered about that in the past when reading about the gestation stall issue. Thanks for that detail. I do have a question for you. The beginning of your article indicated that there are pros and cons to gestation stalls, however I do not see any of the cons noted. Could you elaborate upon the cons? Thank you.